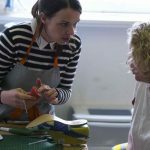 The Hetty Rose brand designs and hand makes bespoke shoes and teaches shoe making courses. 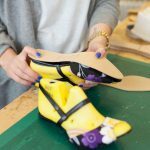 After graduating from the London College of Fashion in a footwear degree, Hetty Rose was created. 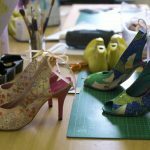 Her signature style is to upcycle vintage Japanese kimono fabrics so the shoes are often very bright and colourful. shops selling beautiful vintage kimono fabrics. 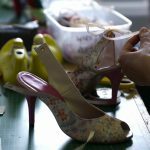 These fabrics have already been un-picked and are in panels, which lend themselves to shoe patterns. Hetty found many more around Kyoto and Tokyo, brought them back to London and experimented in her workshop. 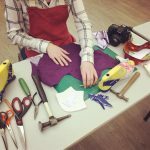 As the fabrics are one-offs they cannot be reproduced, so when she finds something gorgeous, she has to do it justice by making it into something really wonderful. As a brand, they try to encourage traditional methods. 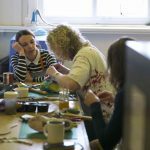 They feel it is important to promote handcrafted products, made in Britain. 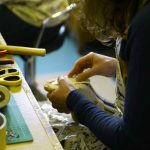 All products are handmade solely by Hetty herself in a workshop, which she enjoys immensely. 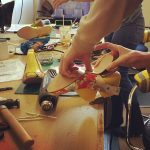 The shoe making workshops they host are also a wonderful way of teaching others how to make their own shoes and passing on the knowledge and joy of shoe making. 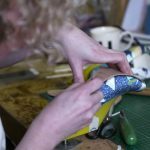 Stranger Than Paradise Productions spent a day with Hetty in her studio in Woolwich in South East London to learn all about her brand , shoe making and workshops.